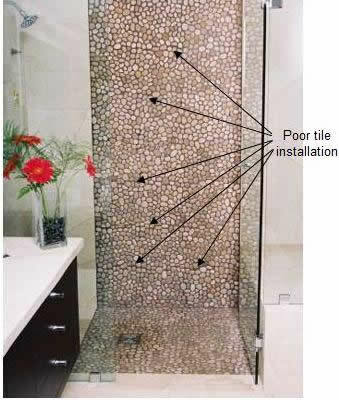 Pebble tiles, as shown in Figure 1, for walls, floors and shower stalls are one of the latest products to hit the market in home remodeling. They are no more difficult to install than any ceramic, porcelain or glass mosaic tile and are installed in the same manner. 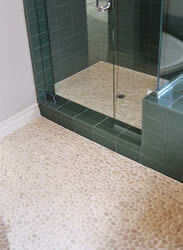 The use of pebble tiles is not confined to the bathroom. They are excellent for foyer and kitchen applications. Anywhere, where you are considering the installation of any other ceramic, porcelain or natural stone tile is a suitable situation for pebble tiles. 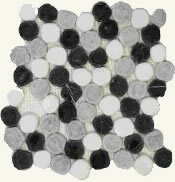 Most pebble tiles are made using natural small pebbles glued to a backing sheet, 12" x 12", as shown in Figure 2, in the same manner as most mosaic tile sheets. The better pebble tiles are made as 12 x 12 sheets but do not have square sides allowing them to interlock when laid as shown in Figure 3. 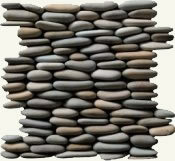 This helps to avoid the visual "line" effect that is sometimes created when installing sheets of small tiles or in this case pebbles, as shown in Figure 4. There should never be visible lines between sheets of pebble tiles. 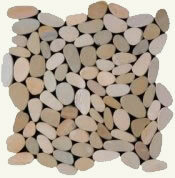 Pebble tile comes in a host of different colors, patterns and configurations. A few of the more unusual pebble tiles are shown in Figures 5, 6 & 7. 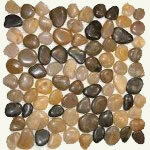 Figure 5, the sliced pebble tile has pebbles that have been ground or sliced to make them perfectly flat. This makes the surface texture smooth to walk on. Figure 6 has pieces of stone. The stones have been crushed to produce smaller pieces, those pieces are then ground to make a smoother surface, with sharper connecting edges. Figure 7 uses the pebbles laid on their side. This produces a rougher surface texture and can create a difficult grouting process. Most stone is porous to some degree. Mosaics of any kind display a large amount of grout. Because or the porosity of the stone and the amount of grout utilized it is important that pebble tiles and the grout be sealed after installation. Make sure you follow the manufacturer's instructions with respect to adhesive, thin-set and grout drying times.